This Camp Chef Cast Iron Conditioner is the best way to "season" your cast iron Dutch ovens, cookware, grill grates, or burners. Recommended by world champion Dutch oven chefs. Made of all-natural ingredients to protect your cast iron. It only takes a little of the mixture to properly care for your cast iron to ensure years of use. A must have for any who regularly uses their cast iron. 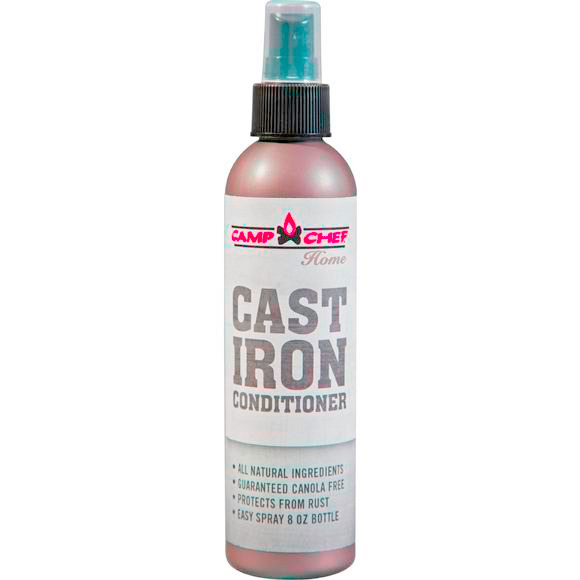 This Camp Chef Cast Iron Conditioner is the best way to "season" your cast iron Dutch ovens, cookware, grill grates, or burners. Recommended by world champion Dutch oven chefs. Made of all-natural ingredients to protect your cast iron. It only takes a little of the mixture to properly care for your cast iron to ensure years of use. A must have for any who regularly uses their cast iron. Now in a new easy spray bottle.